A well designed kitchen is truly a thing of beauty. Have you ever dreamed of long expanses of easy clean counter tops, state of the art appliances and abundant cabinet storage? The perfect kitchen isn't created with technology alone, it must have heart. 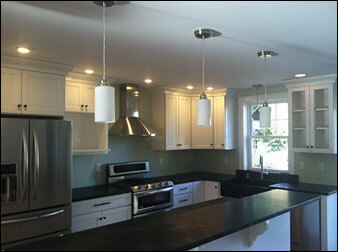 When you're dealing with New England Kitchens, we help you get to the heart of the matter. Your kitchen should meet the needs of every member of your family, and it should be a room where your guests feel comfortable gathering in. At New England Kitchens, we bring over 32 years of experience in the design and installation of quality dream kitchens. At New England Kitchens, we help you achieve your dreams while respecting your budget and schedule, in a professional and friendly manner. Call us today or visit our showroom, you'll be glad you did.